1. Editing a Client Entry. To edit a Client entry first click on the CRM button onto the JGID taskbar and then select Clients from the drop-down menu. 2. 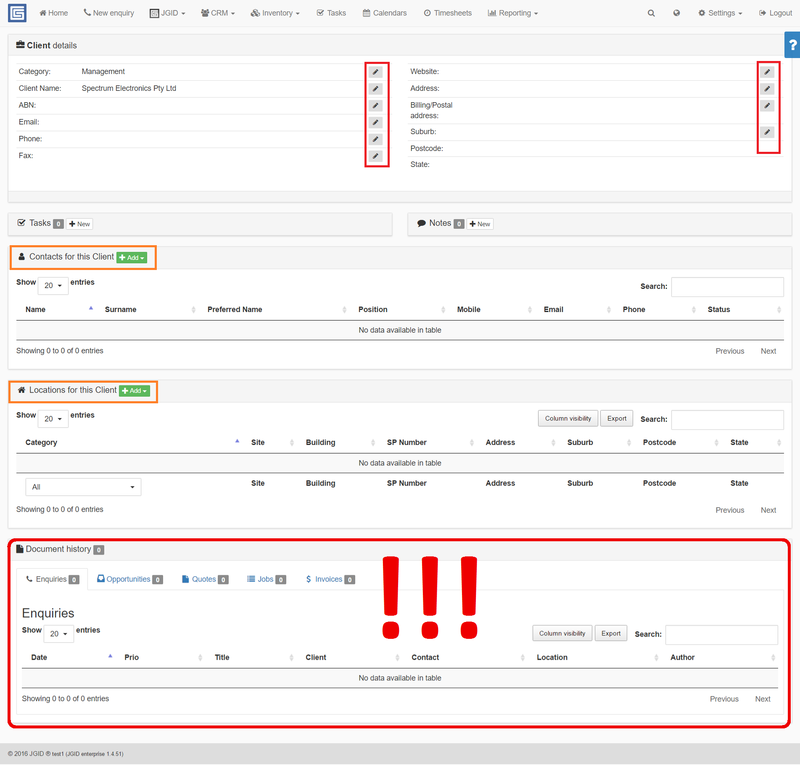 Search for the Client name by either scrolling doen through the Clients list on the dashboard or by typing either the whole name or a portion of the whole name of the Client into the searchbar on the top left side. 3. Select the relevant client name and click on it. You will be transfered to the Client entry edit panel. Once opened you will be able to edit all relevant entries, referring to this Client including the Contacts and the Locations associated with it. For the purpose simply click on the edit pen on the right side of each detail line. 4. Pay special attention to the Document history section, which is only accessible through the Clients category into the CRM. In this section you will conveniently get access to a brief numerical summary of all documents issued in regards to your business with this particular client. To review each document in details, simply click on one of the tabs for either the Enquiries or the Opportunities, the Quotes, the Jobs or the Invoices.